Kymberlee Ruff here again. In the last 15 years I have studied extensively the wisdom of the Native Americans and integrated into my practice. My grandfather was Cherokee and I inherited the gift of "Cherokee Dream Walker".I was also adopted into a Hopi family in 2006. 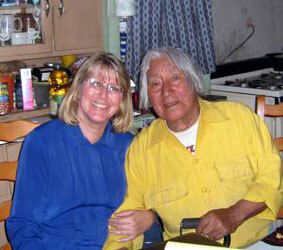 Kymberlee has studied the Peaceful Ways of the Hopi with her adoptive Grandfather Martin Gashweseoma.